I’m composing this blog as I’m sitting on a bench at CFS. It certainly feels like home! Luke and I spent the morning stenciling the entrance door to the workout area. I’ve been told that I inspire people, and I hope to continue to help athletes overcome difficulties or obstacles. 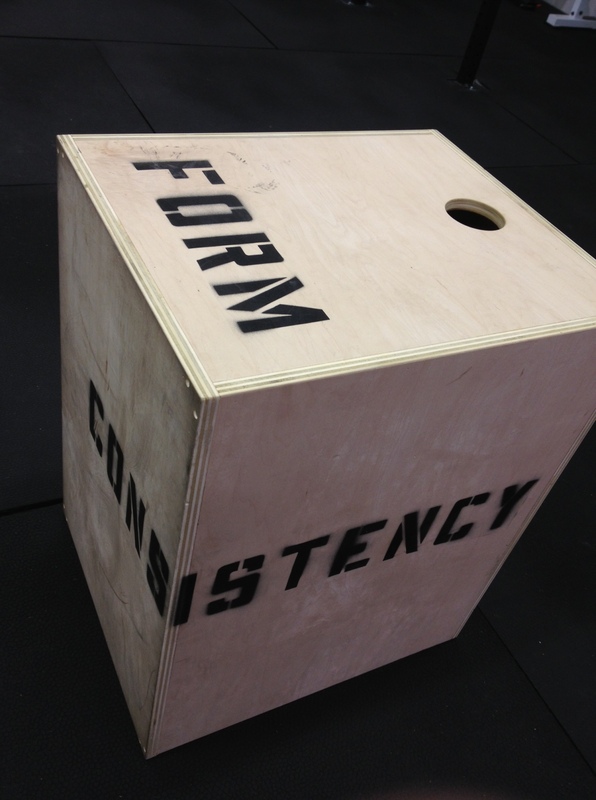 From this moment forward, box jumps will be called box “surmounts”. During today’s grueling metcon, I realized while I don’t at all mind working out alone or working out with athletes that I’m not coaching: no one can cheer for me! I’m left to my own devices, and as faithful readers know, I approach each workout with specific, measurable, attainable, realistic, and time-bound goals in mind. Today was no exception. After completing a rather intense warmup/mobility session, I went straight (forward?) to work. Having nursed my shoulder for so long, it’s been quite some time since I worked on thruster form. I completed sets at 75, 85, 95, 105, & 115#, focusing on form, form, and form. Yup, I recorded and immediately reviewed all sets. I discovered that I look very hot in a V-neck tee shirt. True story. I once again completed a workout that was posted on the main site. 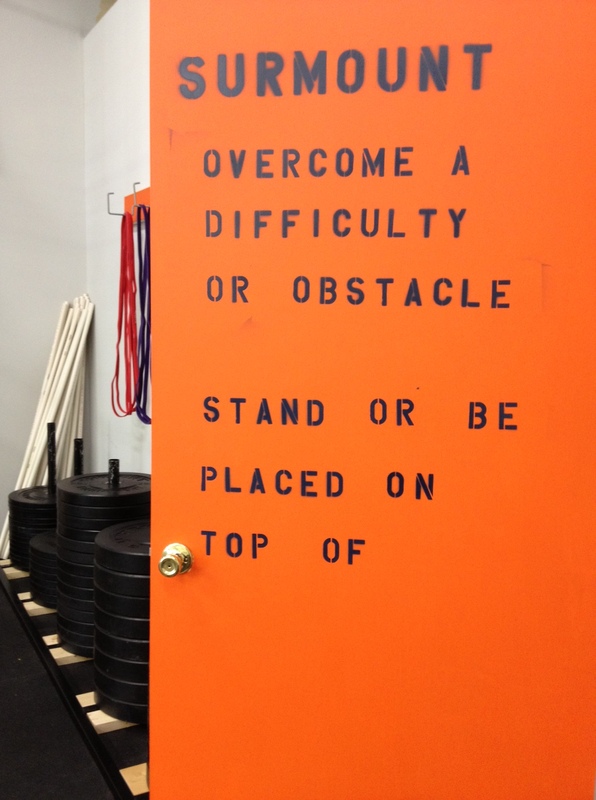 This, like hero WODs should be, was challenging. This WOD, however, was deceptively challenging. It’s a bodyweight WOD; thus, I set a goal to complete all rounds unbroken. I felt as if I were being crushed by a, well, wall during wall walks. I can’t recall forward rolls being included in a WOD, and after today I am going to make sure I program into WODs at CFS. After completing just 3 forward rolls (on a yoga mat going forth and back), I was very lightheaded. This made walking up the wall that much more challenging. I completed all rounds of forward rolls and toes to bar unbroken. I lost focus during the 5th round and missed a box jump. I looked down at the box and saw the word “form”. Yup, it’s a good reminder. I completed first 4 rounds of wall crawls unbroken, 5th and 6th round in reps of 3 & 2, and last round in reps of 2 & singles. I made sure to swing my arms across my chest twice before beginning a wall walk after stopping, and that seemed to help. I also ensured that I walked my feet down as well as up the wall, i.e., I didn’t merely let my legs drop to the floor once my chest touched the wall. Posted in Misc	Hero WOD "Adrian"